Almost always, my favorite part of a meal is....DESSERT! 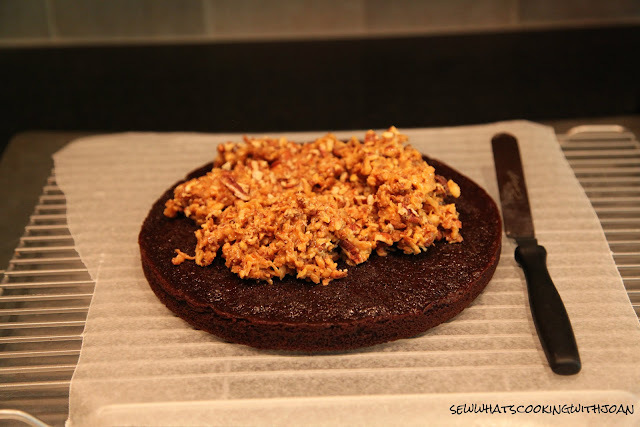 For the Octoberfest party I made JJ's Inside-Out German Chocolate Cake. It was delish and not much was left over at the end of the night. 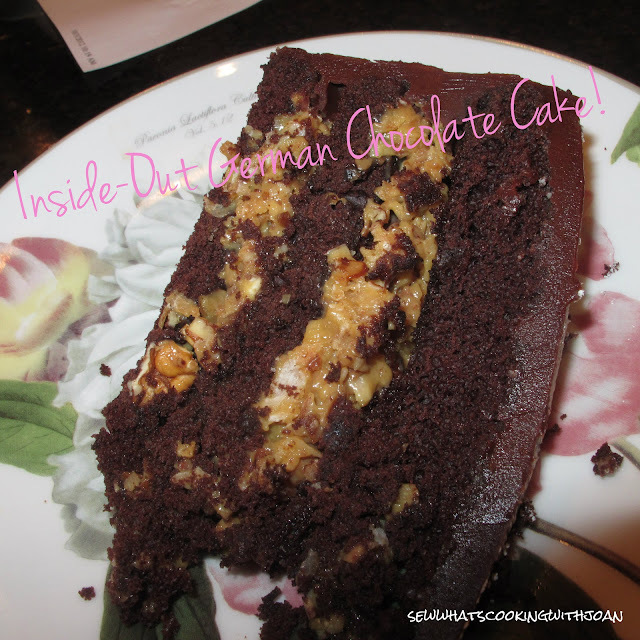 I still have a slice or two tucked away in my freezer for a rainy day when a chocolate pick me up is in dire need! 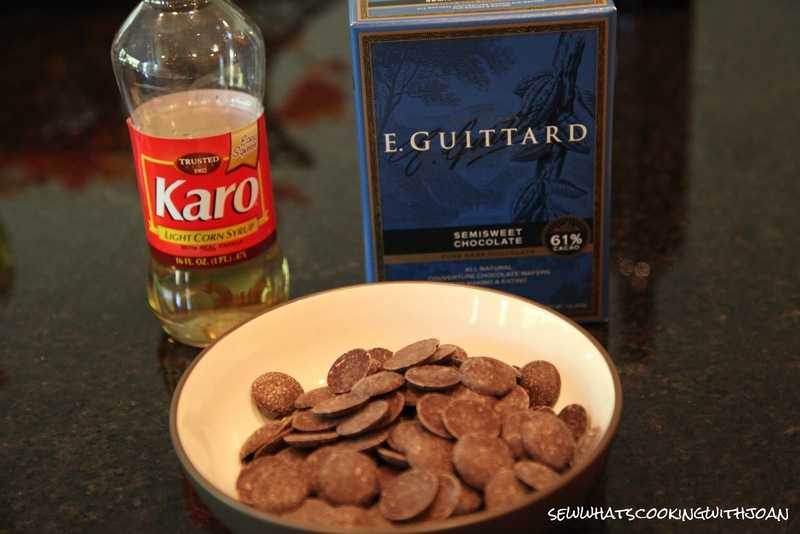 Originally taken from 'Gourmet|March 2000', this has been a family tradition for many years. As explained in the recipe, the chef uses Valrhona cocoa powder in her cake, but other Dutch-process cocoa powders work equally well. The filling is made from sweetened condensed milk that is cooked in a water bath in the oven until it caramelizes. I think it adds a wonderful richness to the rest of the cake. I could eat the milk/coconut filling alone, it's that yummy! *This recipe makes about 12 servings. Preheat oven to 350F and oil cake pans. Line bottoms of pans with rounds of parchment or wax paper. Sift together sugar, flour, cocoa powder, baking powder, baking soda and salt into a large bowl. Whisk together whole milk, butter, whole egg, yolk, vanilla and almond extract in another large bowl until just combined. Beat egg mixture into flour mixture with an electric mixer on low speed, then beat on high speed 1 minute. Reduce speed to low and beat in water until just combined (batter will be thin). Divide batter among cake pans (about 1 1/2 cups per pan) and bake in upper and lower thirds of oven, switching position of pans and rotating them 180 degrees halfway through baking, until a tester comes out clean, 20 to 25 minutes total. Reduce oven temp to 325F. 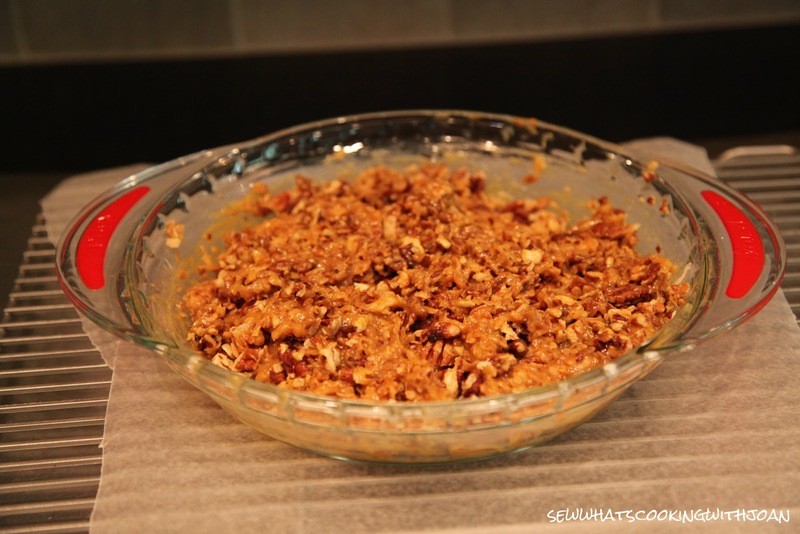 Spread coconut in a large shallow baking pan and pecans in another. Bake pecans in upper third of oven and coconut in lower third, stirring occasionally, until golden, 12 to 18 minutes. Remove pans from oven. Increase oven temp to 425F. Pour condensed milk into a 9-inch deep-dish pie plate and cover tightly with foil. Bake milk in a water bath in middle of oven 45 minutes. Refill baking pan with water to reach halfway up pie plate and bake milk until thick and brown, about 45 minutes more. Remove pie plate from water bath. Stir in coconut, pecans and vanilla and keep warm, covered with foil. Melt butter in a saucepan. 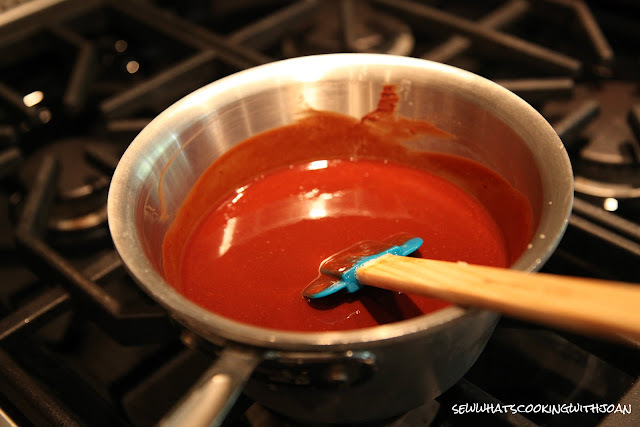 Remove pan from heat and add chocolate and corn syrup, whisking until chocolate is melted. Transfer 1 cup glaze to a bowl, reserving remaining glaze at room temperature in pan. Chill glaze in bowl, stirring occasionally, until thickened and spreadable, about 1 hour. 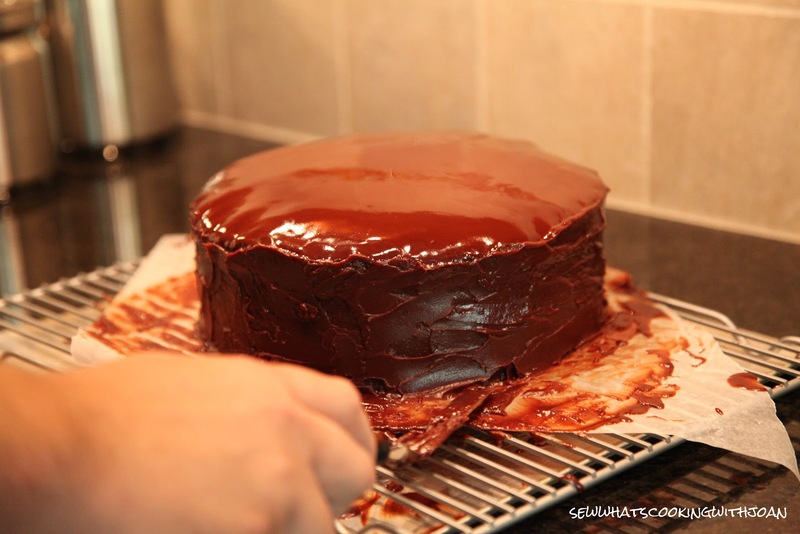 Put 1 cake layer on a rack set over a baking pan (to catch excess glaze). Drop half of coconut filling by spoonfuls evenly over layer and gently spread with a wet spatula. 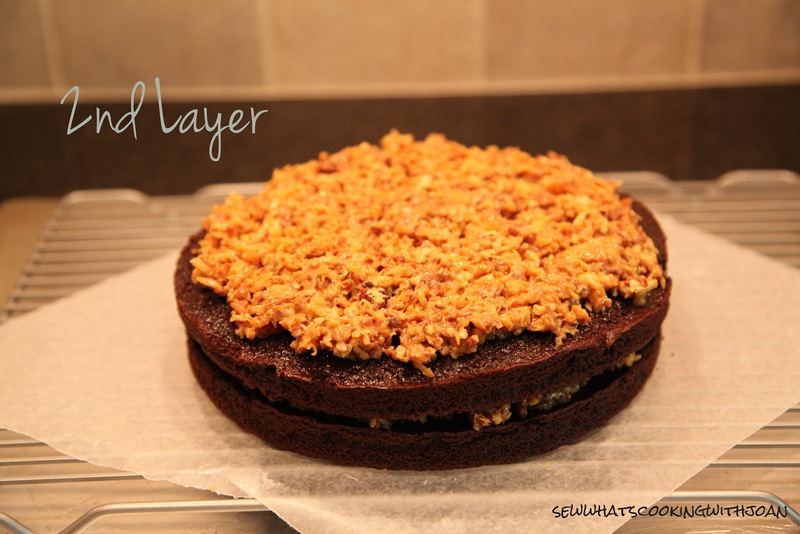 Top with another cake layer and spread with remaining filling in same manner. Top with remaining cake layer and spread chilled glaze evenly over top and side of cake. Heat reserved glaze in pan over low heat, stirring, until glossy and pourable, about 1 minute. Pour glaze evenly over top of cake, making sure it coats sides. Shake rack gently to smooth glaze. 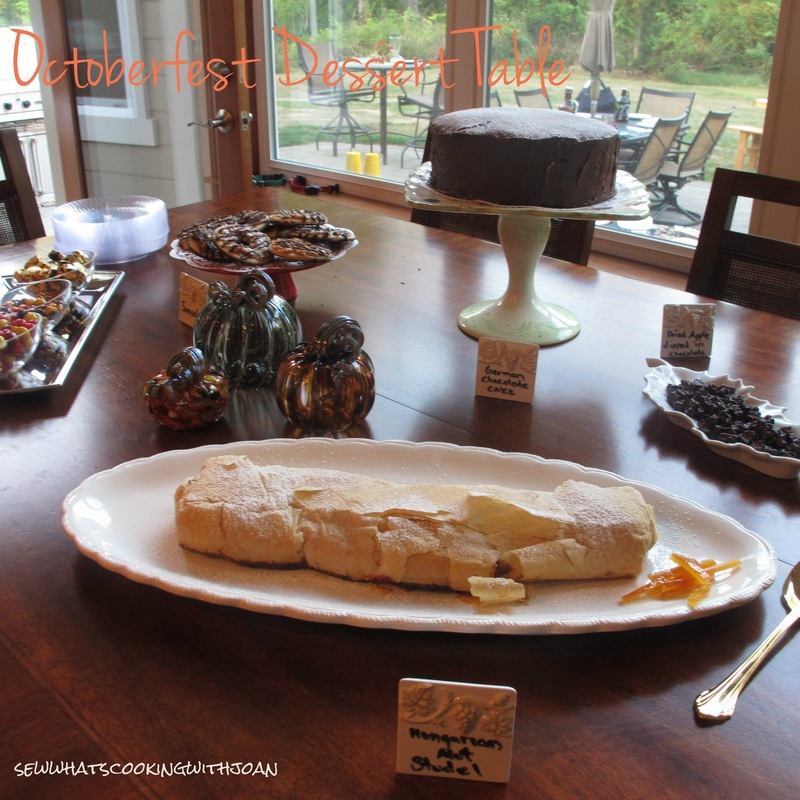 Here is a picture of our dessert table. You can find the ceramic (write-on) place stands at most kitchen shops. They are a fun way to display your goodies! I hope you make some or at least one of these dishes for an upcoming party you host. With the holidays right around the corner, I know most of us are on the hunt for something new to make. I just got my November issue of Food Network magazine and can't wait to look inside in hopes to find something that inspires my Thanksgiving menu! 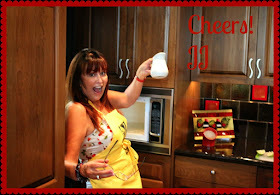 JJ's been busy in the kitchen this week and promises not to disappoint for her upcoming blog next Monday!! Amy did an excellent job baking this scrumdidelumtious cake! If you love chocolate or have a friend that does, this is really over the top!